Wildlife Pictures - feeding Humpback Whale - Megaptera Novaeangliae at sunset. Humpback whales are frequently seen around Cape Cod, in the USA. 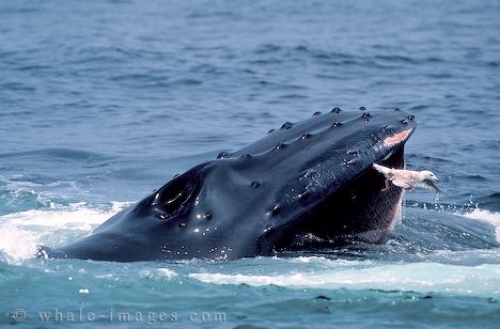 I shot these wildlife pictures of a humpback whale eating at Cape Cod, most likely feeding on Sand Lance, a small fish found in the surrounding waters. The sea gull flying by, gives a great deal of perspective to the size of the humpback whale which in these wildlife pictures we can only see the mouth of this magnificent creature. Picture of a Humpback Whale head, the baleen and a seagull escaping from a big mouth.